Happy Sunday Friends! Today I have my all-time favorite soup to share with you guys. I’m one of those people who only likes to eat soup when it’s cold out. Is that strange? 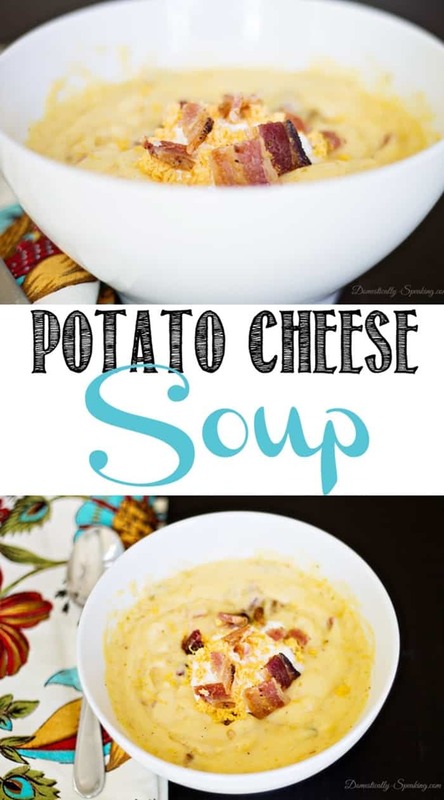 I can’t think of eating soup when it’s hot out… Which here in Southern California leaves a small window for me to make and enjoy this delicious Potato Cheese Soup. This makes a good size batch… 7-8 large bowls. I love making a big batch during a cold week and having it for lunch each day. In a large pot melt your butter. Stir in flour; continuing to stir until smooth and bubbling. Allow the flour to cook out, approximately 30 seconds... keep stirring. Add the cooked potatoes to the pot. Continue to cook, stirring constantly, until soup begins to bubble. Then you can reduce the heat and let it simmer gently for 10 minutes. Add your remaining ingredients and stir until all the cheese has melted. Oh, this looks so good! I love soup so I’ll be trying this soon. 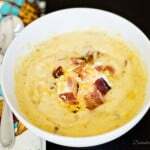 Potato soup is a favorite in our home and can’t wait to give yours a try!! So many variations out there and I love trying them all!! 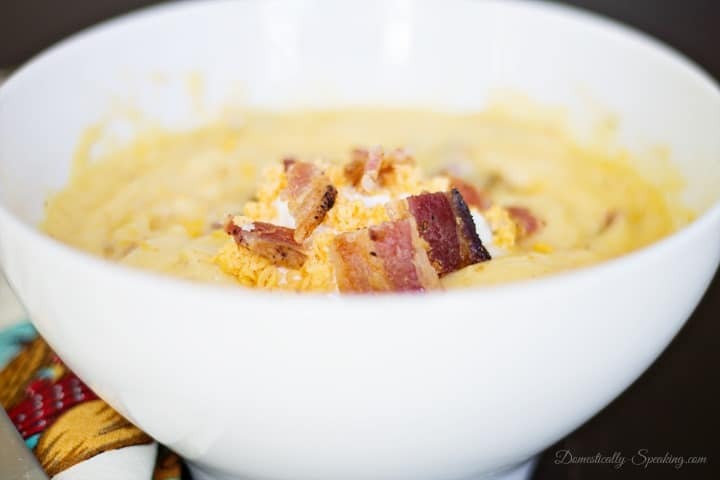 I can’t wait until a little cooler weather blows in so that I can make this soup! It looks so delicious! Thanks for sharing this great recipe. It sounds delicious and we can’t wait to try it! I make this dish all the time and it was one of my favorites on your site. Thanks a lot for sharing. The bacon is an awesome touch. Oh you are making me hungry!! Pinned. Thank you for sharing at Merry Monday! Very tasty! Thanks for sharing! The only change I made was buying organic potatoes and leaving the skin on. That looks delicious! Pinning it! Hi Maryann! I found your blog through Bloglog, and I’m so glad I did! This soup looks great! My husband and I are big soup people, so I’m always looking for new recipes to try.